Forever Living is the largest grower, manufacturer and distributor of Aloe Vera products in the world and relies with representatives who sell through home parties. For their new Essential Oils product, they needed a breakout design to house a complex line that could withstand the rigors of distribution via everything from professional shipping to an individual’s car trunk. Enter Studio One Eleven. The resulting packaging – a component-based, modular design with a sleek, fresh, and highly functional form no matter if it is delivering one product, a few products, or the entire line – is unlike anything in the marketplace. The project as a whole incorporated new designs for the glass, caps, labels, secondary PET resin thermoforms, chipboard boxes and cartons, and packaging graphics. The core of the package is a triangle-shaped box. The boxes attach and fold together to create a half hexagon that can be paired with another half to create a kit housing all of the basic oils and blends. Dramatic black matte graphics punctuated by vibrant botanical photos in vivid hues, as well as spot varnish, hold strong visual appeal for the predominantly female consumer. The larger product set is comprised of three triangle-shaped compartments. When assembled and sealed with a branded flap, a unique trapezoid carton takes shape. The carton has over 20 printable surfaces that can be used to carry the brand message and required product information. 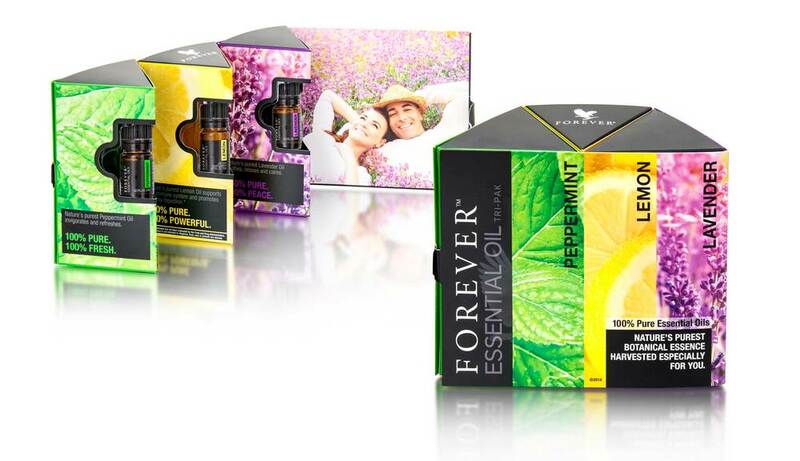 This package design is the most successful Forever Living has ever had in terms of fit, execution, and function. With outstanding performance in initial U.S. and European markets, plans are to expand into 70 additional countries in 2016.